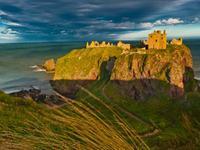 Portknockie is a historic fishing village along this stunning bit of coastline. 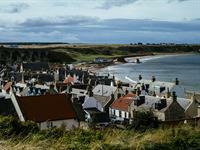 You can walk from Findochty along the old railway line, about 2 miles along the coastal path. It’s a well maintained path and is suitable for buggies and cycling. 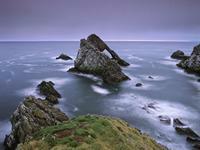 Visit Bow Fiddle rock, a stunning rock formation, 50 feet high and composed of quartzite rock it forms a large sea arch. The Victoria Hotel serves good food both at lunchtime and in the evening. If you’re feeling energetic continue walking along the railway line from Portknockie, or take the coastal path past Bow Fiddle rock and walk along the stunning sandy beach to Cullen. There is a good choice of cafes and small shops in Cullen, and no visit would be complete without one of its infamous ice creams! There is also a fish and chip shop and an excellent Chinese takeaway. The ruins of Findlater Castle stand on a rocky promontory projecting out into the sea some two miles east of Cullen and a mile west of Sandend. Brown tourist signs direct you from the A98 to a parking area at a farm, Barnyards of Findlater, and from here it is a half mile walk along a good grassy path to the interpretive board on the cliffs behind the castle.